First, an update: My friend, Nell from Atlanta, sent me the link to the scarf from Project Runway that I mentioned in yesterday's blog. Thanks, Nell! Click here if you want to knit a rat scarf for yourself. There is a category of knits that I refer to as "just because you can knit it, doesn't mean you should." I was reading some posts on a knitting group that I belong to and a reference was made to a hat pattern that I'd forgotten about - or maybe I'd just blocked it from my memory. It's the Champagne Fizz Hat from Kniting Daily, September 15th, 2009. 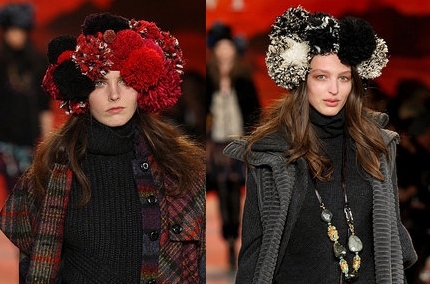 Around the same time, Diane von Furstenberg had a runway show﻿ and had similar hats with even bigger pompoms. I was thinking of the poor girls who are wearing them. They are now a professional models, ready to walk the runways of New York, Paris and Milan, and what are they given to wear? Knitted hats with giant pompoms! 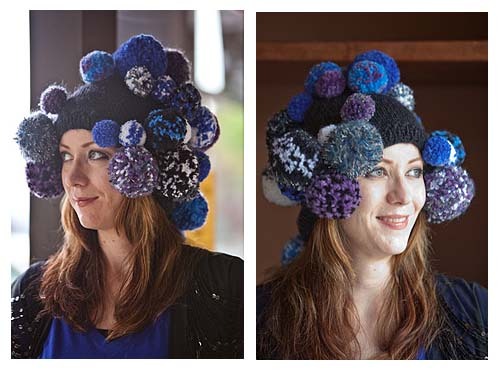 The pattern is still available, click here. You know you want it! !